During the past 100 years, plastic packaging has replaced time-tested containers like glass, tin cans and wooden barrels. Plastics found a place in shipping, home kitchens and food packaging because it is durable, lightweight and relatively easy to recycle. The federal government classifies plastics into seven categories and labels each item with a number that corresponds to the content of the plastic. Use these numbers to choose packaging that you can reuse safely. The American Chemistry Council recommends that you wash all reusable plastic containers with hot soapy water before you reuse them. Polyethylene terephthalate (PET or PETE) bottles are the most common plastic container in use for soft drinks, juice, peanut butter, salad dressing, ketchup and water. The number “1” on the recycling icon identifies all bottles in this category. Currently, the American Chemistry Council states that is okay to reuse these bottles, after washing them. Eco Village Green notes many PET bottles are difficult to clean and may leach endocrine-disrupting chemicals when exposed to high temperatures. Most manufacturers intend for consumers to use each bottle once, so more research will determine if consumers can safely reuse one-time-use bottles. Opaque plastic bottles, often used for milk, juices, detergent, yogurt and margarine tubs, belong to the high-density polyethylene (HDPE) category of plastics. The American Chemistry Council and Care2 agree that it is safe to reuse these bottles after you have finished the original contents. To date, no research indicates that this plastic category leaches hormone-disrupting chemicals or any substances that may cause cancer. You will often find low-density polyethylene (LDPE) plastic in packaging for bread wrappers and frozen food, plastic wraps for food storage, grocery bags and trash bags. This category of plastic is safe to reuse, within reason. Consider the original purpose of the packaging before you use it to preserve or store food. These plastics are thin films that are lighter weight than other categories of plastic, so they can melt or emit toxic chemicals if exposed to high temperatures, including the microwave. Manufacturers use polypropylene (PP) plastic for some toys, baby bottles, drinking straws, syrup, yogurt, margarine and deli soup containers. The current research does not show any evidence that this category of plastic leaches harmful chemicals. Consumer concern about bisphenol A (BPA)--a synthetic hormone that can disrupt normal endocrine functions and possibly contribute to cancer--in baby bottles and reusable plastic water bottles has made some people leery of buying products that contain polypropylene. Baby bottles with the recycling code #7 are the only ones that have the potential to leach BPA. This category number applies to many types of plastic and synthetic resins that do not fit the other classification numbers. 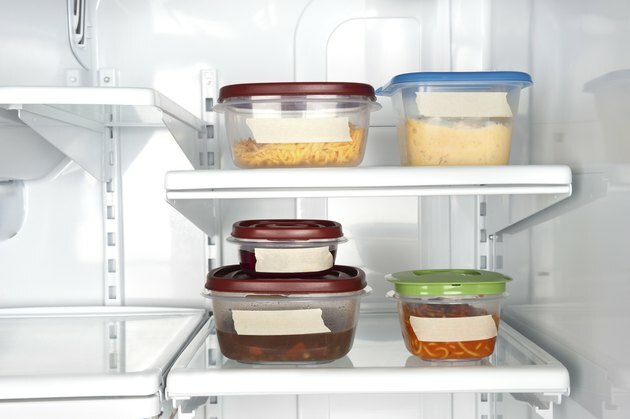 Which Plastic Containers Can I Safely Use? Which Plastic Bottles Are Safe?